Help CentreUsing SuperControl Managing bookingsHow do I charge a cancellation fee? 5. If you select Customer Payment you will see the "Fee" box will default to the same amount that the guest has paid. You would choose this option if you are retaining the full amount the guest has paid as a cancellation fee. 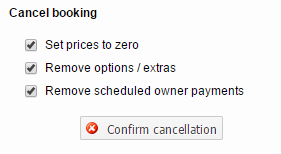 Prev: How do I cancel a booking? Next: How do I reinstate a cancelled booking?